A glorious fall enabled the wild horses to build up their reserves to face the coming winter snows which have now arrived in the hills. 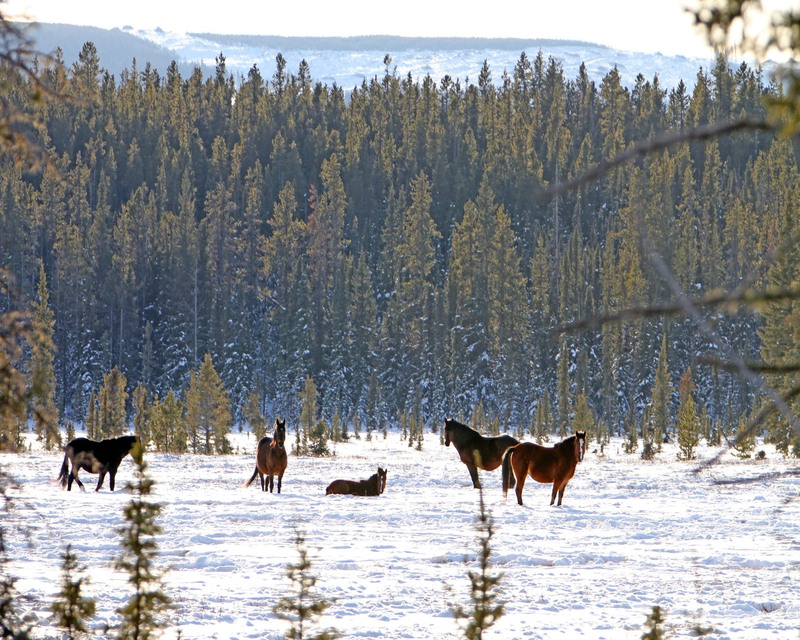 During the month of November, the fall big game hunting season caused the horses to become very nervous and skittish. Therefore a lot of the herds stayed away from the trails and roadways which lace wild horse country. There was only one very short-lived cold snap with very little snow that appears not to have affected the horses at all. We have travelled the trails around the area where the October foal Little Wonder’s herd was last seen. So far we have been unable to locate the herd to check on the welfare of the foal. We are still hopeful now that the hunting season is over and the back country has become quiet again we will be able to locate the herd. On December 3rd a major snow storm hit the foothills in wild horse country. Accumulations of the snow varied from a foot to 2 feet in depth. The horses have now reverted into their winter feeding habits and moved into lower meadows to find the forage they need. Due to the spring and summer we had, where the grasses had grown lush, the meadows still have excellent forage available to all the wild life including the wild horses. 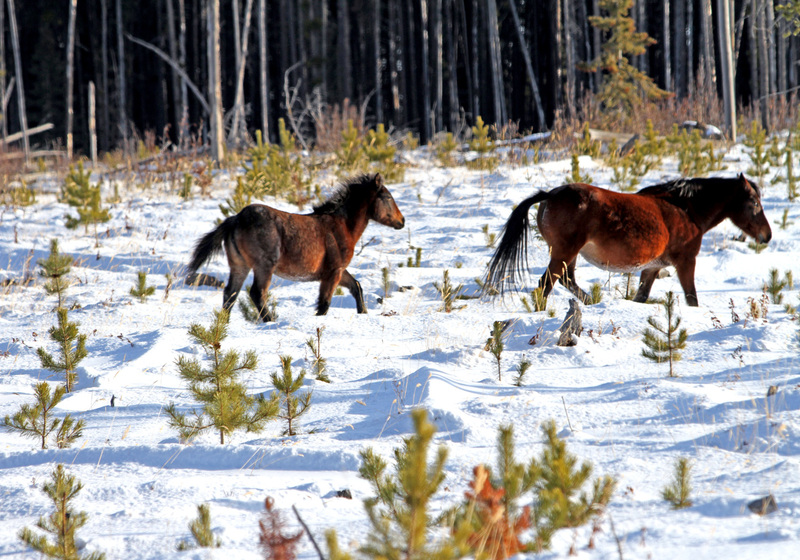 The horses are able to expose these grasses due to their large feet and pawing abilities despite the deep snow. 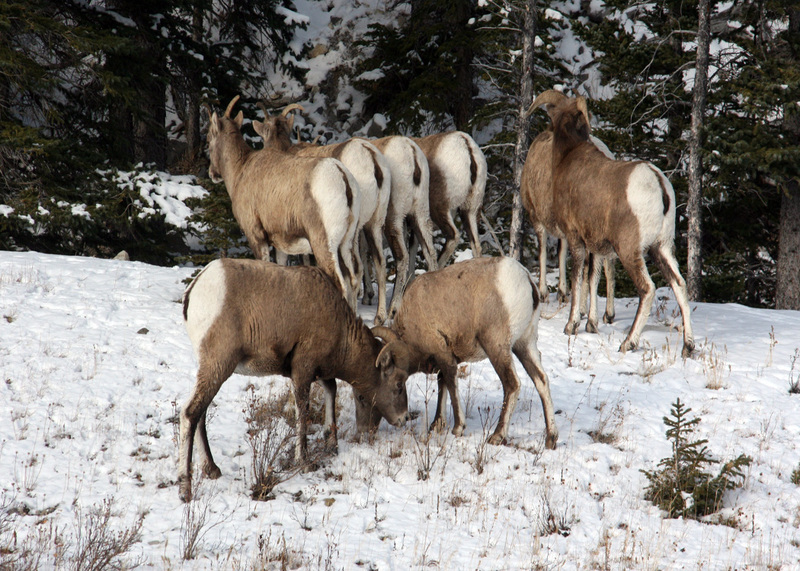 We’ll often find deer or other wild life following the horses to feed on the exposed forage, but also big horn sheep will take advantage of the exposed feed especially after a large snow event. 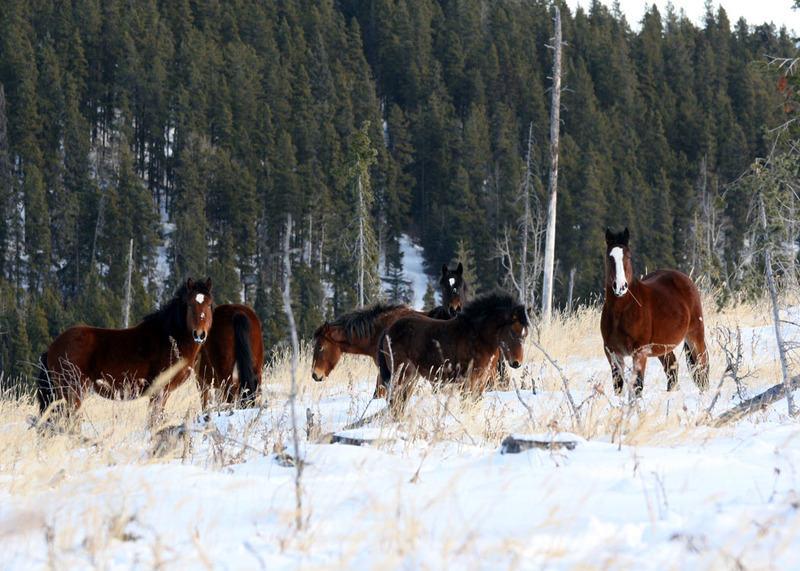 Our first trip back into wild horse country after the snow storm, found that the herds of horses were doing quite well. At present the depth of snow did not appear to be hampering or harming their ability to survive in this sometimes harsh environment. 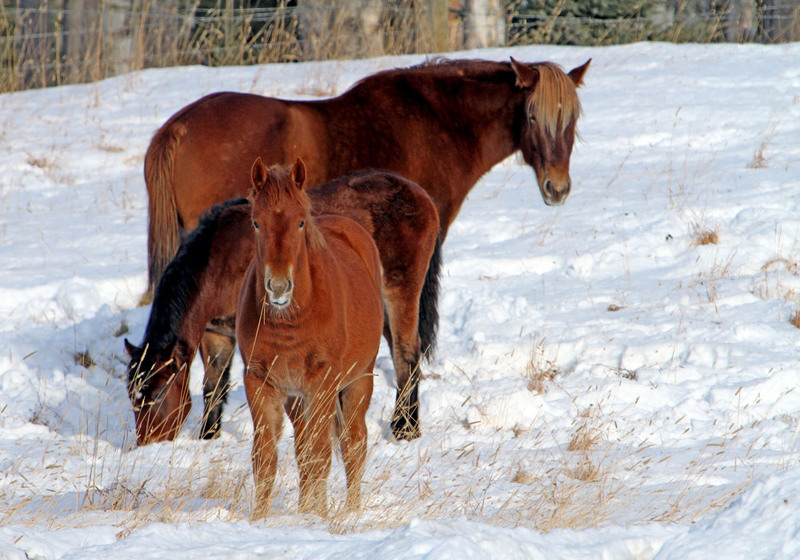 This year’s foals we’ve come across are looking extremely healthy and ready for the possible hardships to come as the winter gets more severe. My love and respect for the wild horses grows each time I travel into their habitat and observe them throughout the year. This is especially true at this time of year when one can witness the dynamics of a wild horse herd and the way that they seemingly care for each other. It’s the stallions who still continue to win my heart as they will always stand guard when the foals and mares are feeding. 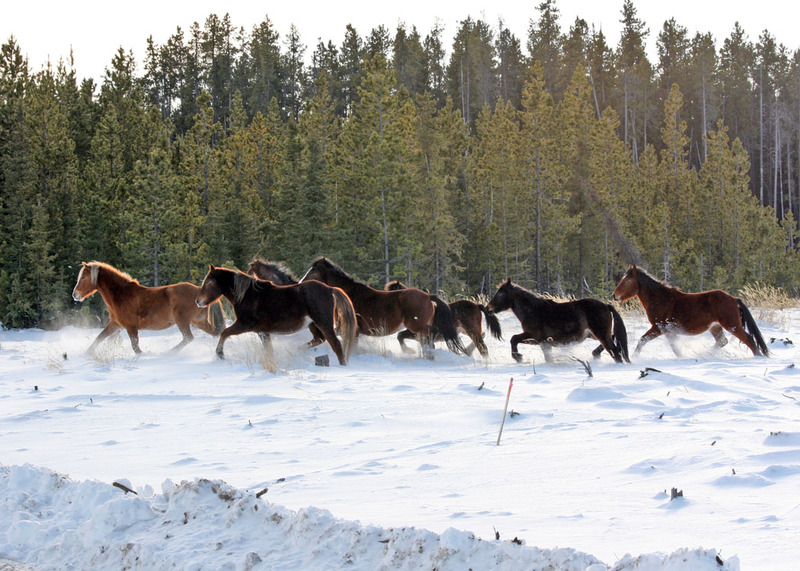 As the winter progresses the journeys that we take increase due to the one negative factor that affects wild horses and that is the capture season that is still allowed by the Alberta government, SRD. This enables us to monitor the activities of the individuals that still think it necessary to remove these horses from their natural environment. 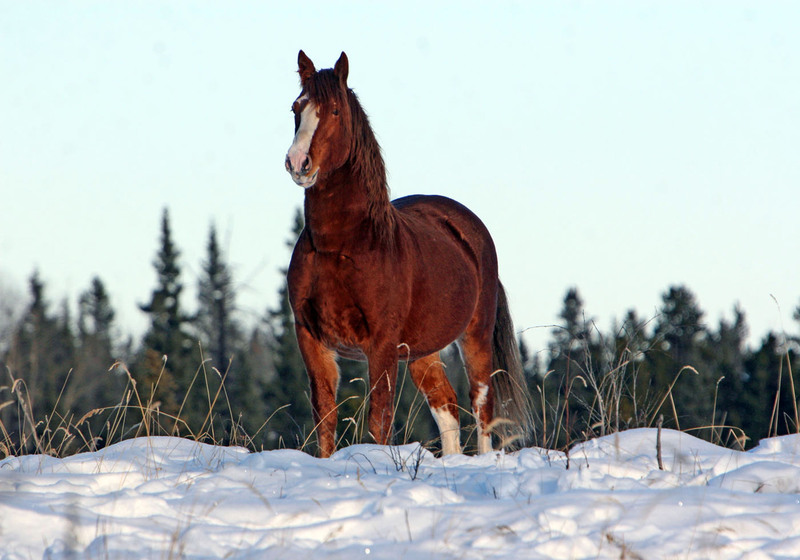 We do though enjoy the pristine and quiet habitat and scenery that winter brings to our Alberta foothills and the wild horse country. 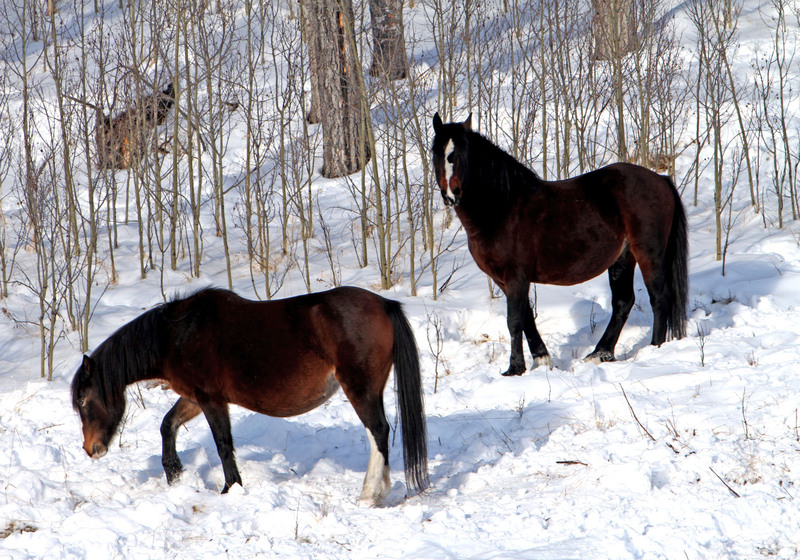 We will continue to update our blog so that you, too, can follow the horses as they make it through the winter months. We continue to feel very grateful for the support of our members and other individuals who are interested in the welfare of your wild horses. Remember our 2012 fundraising calendars are still available although we just have a limited number.